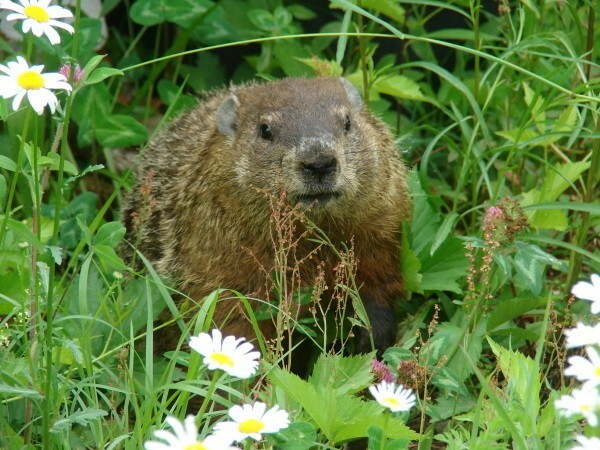 This is a woodchuck that visits my yard at least three times a week. They are quite shy, and it ran off as soon as it realized I was there! He's cute! In the south we call them "Ground hogs". Some people call them "Whistle Pigs". Cute? Yes. Adorable? Maybe. Destructive? Absolutely! My entire summer thus far has been dedicated to "discouraging" 4 of these varmints from visiting my yard...to no avail. No matter what tactic I choose to ban them from the area (short of doing them physical harm, that is! ), they have stripped a good portion of the flower gardens in a very methodical manner. I feel I have lived a "Caddy Shack" season this year due to this ongoing war. Yet, I marvel at their tenacity and ingenuity. This is a love/hate relationship! Cute to look at from a distance but Lantern Lady is sooo right! They haven't attacked my flowers but have tunnels running every which way and live under my garage, the neighbor's air conditioning condenser. Have gnawed, pushed, through areas, under fences, and return every spring with a brand new family. Any suggestions on how to permanently get rid of them? I.e., deter them from visiting?